به دلیل قرارگیری ایران در منطقه خشک و نیمه خشک توجه به منابع آب ضروری به‌نظر می‌رسد. در این میان توجه به منابع آب زیرزمینی به‌دلیل ماهیت پنهان و نیز هزینه‌های استخراج و نیز پایش کمی و کیفی آن از اهمیت ویژه‌ای برخوردار است. به‌دلیل اهمیت موضوع منابع آب در منطقه دریاچه ارومیه به بررسی کیفی آب زیرزمینی در یکی از آبخوان‌های مجاور این دریاچه پرداخته شده است. به‌علت نیاز روزانه انسان به آب جهت مصرف شرب، کشاورزی، صنعت و بهداشت اهمیت ویژه آن به وضوح قابل لمس است. منطقه شیرامین با دارا بودن آبخوانی به مساحت تقریبی 34 کیلومترمربع یکی از دشت‌های حاشیه دریاچه ارومیه است. به‌منظور بررسی آب‌های زیرزمینی منطقه شیرامین از 18 نقطه از سراسر دشت، با در نظر گرفتن بهترین توزیع، نمونه‌ها جمع‌آوری و برای 12 پارامتر آنالیز شدند. 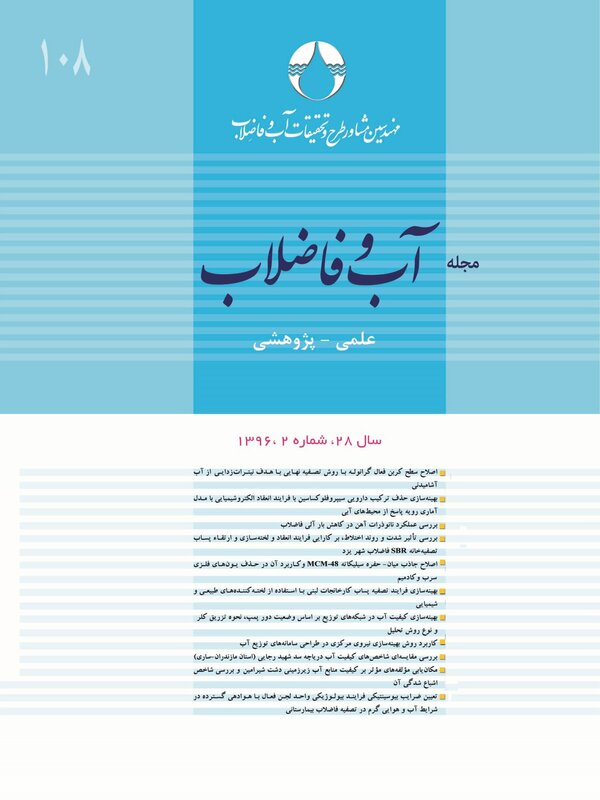 در این پژوهش از روش تحلیل چندمتغیره آماری (تحلیل مولفه‌های اصلی و نمره عاملی) با تلفیق GIS و شاخص اشباع شدگی استفاده شد. اعمال تحلیل مولفه‌های اصلی منجر به استخراج چهار عامل شد. مولفه اول ناشی از تأثیر سازندهای کربناته، مولفه دوم ناشی از تغذیه آب باران، مولفه سوم ناشی از تأثیر سولفات و فلوراید و مولفه چهارم به‌علت بار عاملی بالا برای نیترات ناشی از فعالیت‌های بشری است. درون‌یابی نمره‌های عاملی با GIS نشانی داده که بیشترین مساحت نمره‌های عاملی مثبت مربوط به مولفه اول بوده و از مولفه اول به ترتیب به سمت مولفه چهارم مساحت نمره‌های عاملی مثبت پوشش داده شده کاهش یافته است. به‌طور کلی عواملی همانند کاهش بارش، افزایش برداشت و فعالیت‌های شدید کشاورزی باعث افت کیفیت آب منطقه شیرامین شده است، به‌طوری که نمونه‌های بالادست و انتهای دشت به‌ترتیب دارای شاخص اشباع‌ شدگی مثبت‌تر از نظر سنگ‌های کربناته و هالیت بود. Located in an arid/semi-arid region, Iran calls for special attention to its water resources. More importance should, however, be attached to the groundwater resources due to their hidden nature and the excessive costs associated with their extraction as well as qualitative and quantitative monitoring. Due to the significance of the water resources for activities in the neighborhood of the Urumia Lake, the present study was designed to conduct a qualitative investigation of an aquifer in the area adjacent to the lake. Teh importance of water is especially foregrounded by the increasing daily human demands for drinking, irrigation, industrial activities, and home use. Shiramin area has an aquifer of approximately 34 square kilometers in area and is one of the plains bordering the Urmia Lake. The groundwater resources in Shiramin plain were evaluated by collecting samples from 18 points well distributed across the plain and subjected to analysis to determine 12 water quality parameters. A multivariate statistical analysis (namely, principal components analysis and factor score) was used and GIS and saturation index were also integrated. Four components were extracted as a result of applying Principal Components Analysis, one resulting from the impact of carbonate formations, one caused by water recharge, one due to the effects of sulfate and fluoride, and the fourth one due to the high factor loading of nitrate caused by human activities. Interpolation of the factor scores with GIS showed that the greatest area with positive factor scores was related to the first component and that the area covered by positive factor scores reduced moving from the first to the fourth component. Generally speaking, such factors as reduced rainfall, increased water extraction, and intensive agricultural activity accounted for the degradation observed in the water quality in Shiramin area so that samples collected upstream the plain and those from the plain end exhibited more positive values of saturation index with respect to their carbonate and halite rocks. Adepelumi, A.A., Ako, B., Ajayi, T., Afolabi, O. & Omotoso, E., 2009,"Delineation of saltwater intrusion into the freshwater aquifer of Lekki Peninsula, Lagos, Nigeria", Journal of Environmental Geology, 56(5), 927-933. Andre, L., Franceschi, M., Pouchan, P. & Atteia, O., 2005,"Using geochemical data and modelling to enhance the understanding of groundwater flow in a regional deep aquifer, Aquitaine Basin, south-west of France", Journal of Hydrology, 305(1), 40-62. Anayah, F.M. & Almasri, M.N., 2009, "Trends and occurrences of nitrate in the groundwater of the West Bank, Palestine", Journal of Applied Geography, 29(4), 588-601. American Public Health Association, 1998, Standard method for the examination of water and wastewater, 17th Ed., Washington, DC, USA. Güler, C., Thyne, G.D., McCray, J.E. & Turner, K.A., 2002, "Evaluation of graphical and multivariate statistical methods for classification of water chemistry data", Journal of Hydrogeology, 10(4), 455-474. Hossain, G., Howladar, M.F., Nessa, L., Ahmed, S.S. & Quamruzzaman, C., 2010, "Hydrochemistry and classification of groundwater resources of Ishwardi municipal area, Pabna district, Bangladesh", Journal of Geotechnical and Geological Engineering, 28(5), 671-679. Kaiser, H.F., 1958, "The varimax criterion for analytic rotation in factor analysis", Journal of Psychometrika, 23(3), 187-200. Love, D., Hallbauer, D., Amos, A. & Hranova, R., 2004, "Factor analysis as a tool in groundwater quality management: Two southern African case studies", Journal of Physics and Chemistry of the Earth, Parts A/B/C, 29(15), 1135-1143. Mosaferi, M., Pourakbar, M., Shakerkhatibi, M., Fatehifar, E. & Belvasi, M., 2014, "Quality modeling of drinking groundwater using GIS in rural communities, northwest of Iran", Journal of Environmental Health Science and Engineering, 12(1), 1-14. Mueller, D.K., Helsel, D.R. & Kidd, M.A., 1996, Nutrients in the nation's waters: Too much of a good thing? M. A. Kidd (ed), US Government Printing Office, USA. Merkel, B.J., Planer-Friedrich, B. & Nordstrom, D., 2005, Groundwater geochemistry,A Practical Guide to Modeling of Natural and Contaminated Aquatic Systems, Springer. Noori, R., Sabahi, M.S., Karbassi, A., Baghvand, A. & Zadeh, H.T., 2010, "Multivariate statistical analysis of surface water quality based on correlations and variations in the data set", Journal of Desalination, 260(1), 129-136. Nadiri, A.A., Asghari Moghaddam, A., Tsai, F.T. & Fijani, E., 2013,"Hydrogeochemical analysis for Tasuj plain aquifer, Iran", Journal of Earth System Science, 122(4), 1091-1105. Prasanna, M.V., Chidambaram, S., and Srinivasamoorthy, K., 2010, "Statistical analysis of the hydrogeochemical evolution of groundwater in hard and sedimentary aquifers system of Gadilam river basin, South India", Journal of King Saud. University-Science, 22(3), 133-145. Prasanna, M.V., Chidambaram, S., Hameed, A.S. & Srinivasamoorthy, K., 2011, "Hydrogeochemical analysis and evaluation of groundwater quality in the Gadilam river basin, Tamil Nadu, India", Journal of Earth System Science, 120(1), 85-98. Parkhust, D. & Appelo, C., 1999, A computer program for speciation, batch-reaction, one-dimensional transport and inverse geochemical calculations, USGS Report, USA. Shanmugan, P. & Ambujam, N., 2012, "A hydrochemical and geological investigation on the Mambakkam mini watershed, Kancheepuram District, Tamil Nadu", Journal of Environmental Monitoring and Assessment, 184(5), 3293-3306. Singh, K.P., Malik, A., Mohan, D. & Sinha, S., 2004, "Multivariate statistical techniques for the evaluation of spatial and temporal variations in water quality of Gomti River (India)—a case study", Journal of Water Research, 38(18), 3980-3992. Tabachnick, B.G., Fidell, L.S. & Osterlind, S.J., 2001, Using multivariate statistics, 5th Ed., Pearson, New York. Zhu, B., Yang, X., Rioual, P., Qin, X., Liu, Z., Xiong, H. & Yu, J., 2011,"Hydrogeochemistry of three watersheds (the erlqis, zhungarer and yili) in Northern Xinjiang, NW China", Journal of Applied Geochemistry, 26(8), 1535-1548.